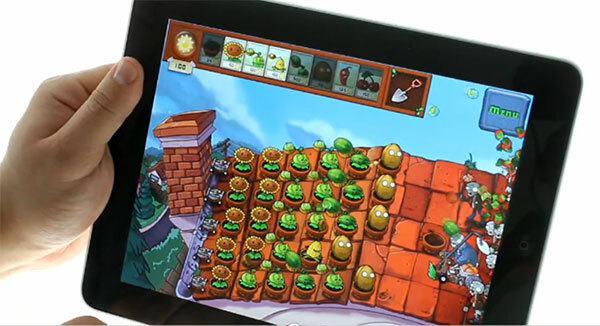 We chose a popular tower defense game for our second demo video of the Apple iPad gaming powers. Developed and published by PopCap, Plants vs. Zombies can give fans of the genre quite a lot of hours of fun. The point of the game is to repel the invading army of zombies from eating your brains by planting a variety of plants. It has been available for a while for PC and Mac so there’s a chance that you are already familiar with it. You have to use some of the 49 different plants that are at your disposal to repel 26 different zombies over 5 different terrains. But there’s plenty more to the game – each of the 18 included mini games that you unlock along the way is so amusing that could be an app of its own, but luckily this is not the case and you can purchase the whole package for a single fee. You can check it out in action in the video below. Be warned though – the game levels are pretty long and you definitely need some kind of support for the hand holding the iPad or you will need to take pretty frequent breaks.